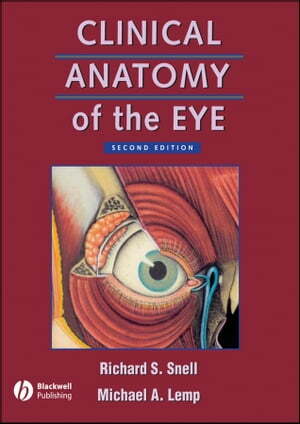 Collins Booksellers - Clinical Anatomy of the Eye by Richard S. Snell & Michael A. Lemp, 9781118691007. Buy this book online. Clinical Anatomy of the Eye has proved to be a very popular textbook for ophthalmologists and optometrists in training all over the world. The objective of the book is to provide the reader with the basic knowledge of anatomy necessary to practice ophthalmology. It is recognised that this medical speciality requires a detailed knowledge of the eyeball and the surrounding structures. The specialist's knowledge should include not only gross anatomic features and their development, but also the microscopic anatomy of the eyeball and the ocular appendages. The nerve and blood supply to the orbit, the autonomic innervation of the orbital structures, the visual pathway, and associated visual reflexes should receive great emphasis. The practical application of anatomic facts to ophthalmology has been emphasised throughout this book in the form of Clinical Notes in each chapter. Clinical problems requiring anatomic knowledge for their solution are presented at the end of each chapter. Illustrations are kept simple and overview drawings of the distribution of the cranial and autonomic nerves have been included.